The last time we walked on a Glacier was in Canada. We took a walk on the Athabascan glacier in Alberta with our New Zealand guide, Becky. 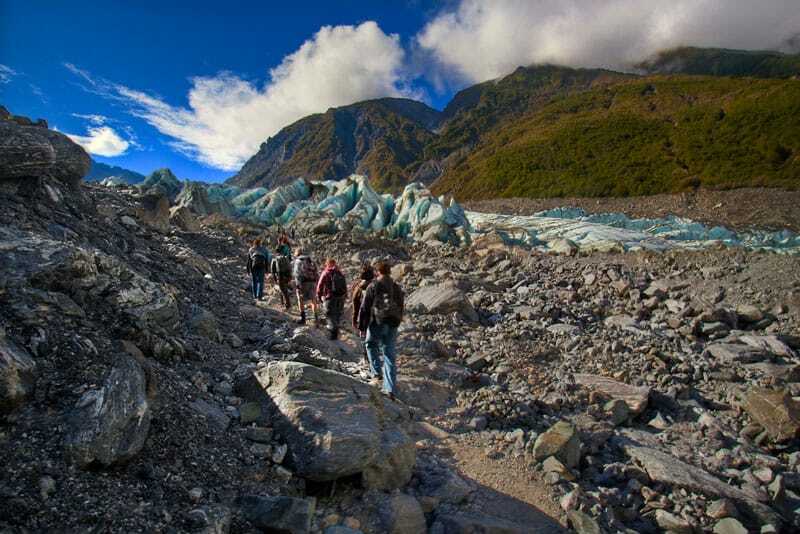 Two years later we are in New Zealand walking on the Fox Glacier. This time her name is Ruth. Ruth didn’t hesitate when we told her Becky’s name. 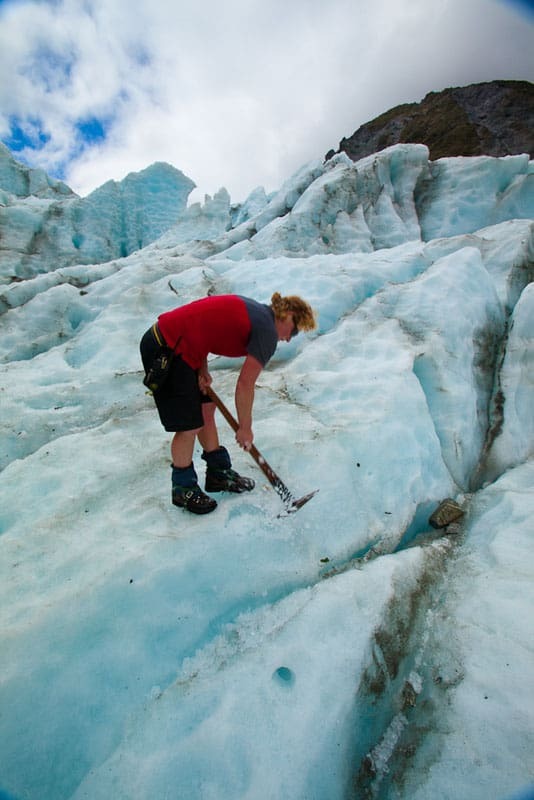 She knew her well and not only that, Becky also works at the Fox Glacier. The glacier guides impress us indeed. 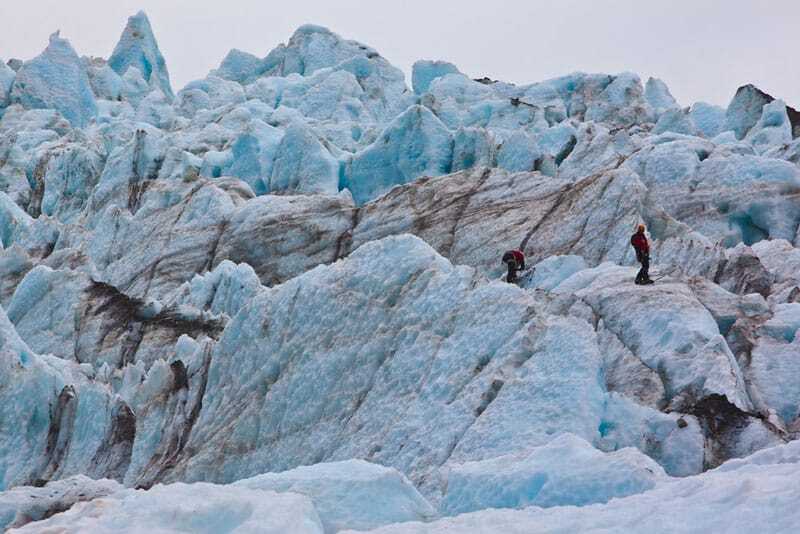 They are fit and strong and never stop cutting steps and pathways to make a route for tourists to travel safely on these unpredictable ice formations. Walking on a glacier is a dangerous business and if you don’t know what you are doing, it could be the last walk you take in your life. If you don’t have experience, you must take a guide with you. 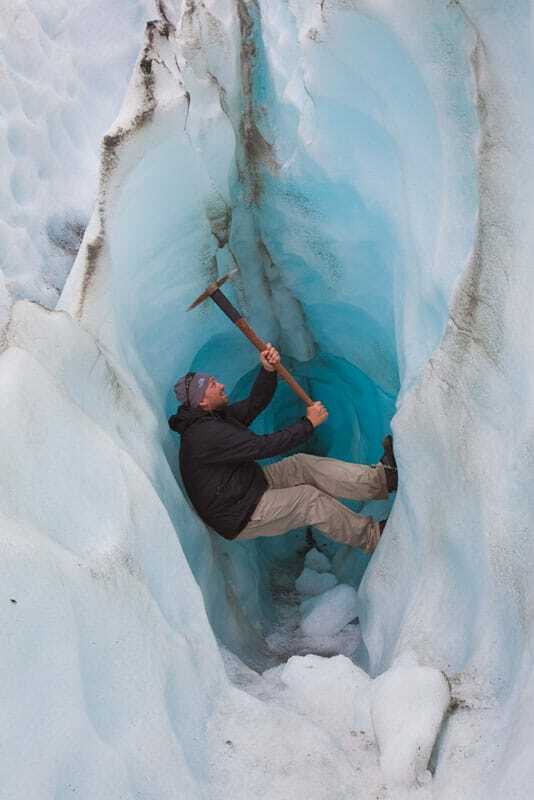 Glacier ice is unstable and crevasses can creep up on you sending you plummeting into a whole and spiraling down below hundreds of tons of ice. 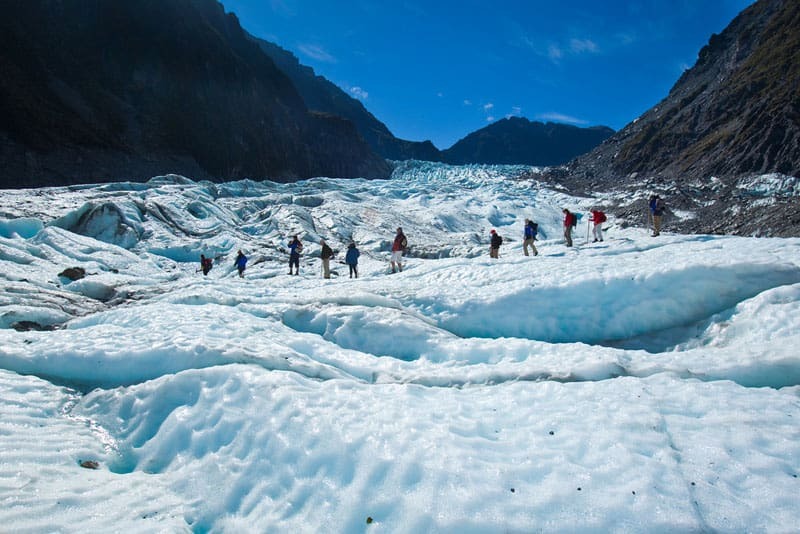 We were hoping to be able to do a helicopter landing and glacier walk with Fox Glacier Guides. In Alaska, both of our glacier landings were cancelled due to inclement weather and we were hoping to finally be able to land on a glacier. Luck wasn’t on our side once again though, the helicopter trip was sold out today. We are traveling on a Flying Kiwi tour and when you are on this or most tours, you see a lot of the country, but you are on a very tight schedule. If the weather is bad or an excursion is cancelled you cannot book for the next day. You will be moving on to the next stop with the tour bus. One unique aspect of the Flying Kiwi is that you can hop on hop off the bus, however the next bus doesn’t come through for another 9 days. Instead we booked a full day walk that was still very satisfying. We were suited up with thick woolly socks and boots suitable for crampons. They gave us a rain jacket and waterproof pants, as you never know when weather will change in New Zealand. We didn’t need them today. The sky was a deep blue and there was nary a cloud to be seen. The weather was downright balmy. So much so that Ruth guided us through the ice in shorts! The Athabascan Glacier in Canada is a little more heart-pounding than the Fox Glacier in New Zealand. I was expecting giant holes that we would have to avoid, but Fox mostly has small tubular holes known as Moulins that feed down to the water flow below the glacier. I wasn’t complaining, I enjoyed not having to worry about plunging to my death. When we did come across giant holes, they were above the ice with no chance of plunging below. We could even walk inside some of them if we wanted to. 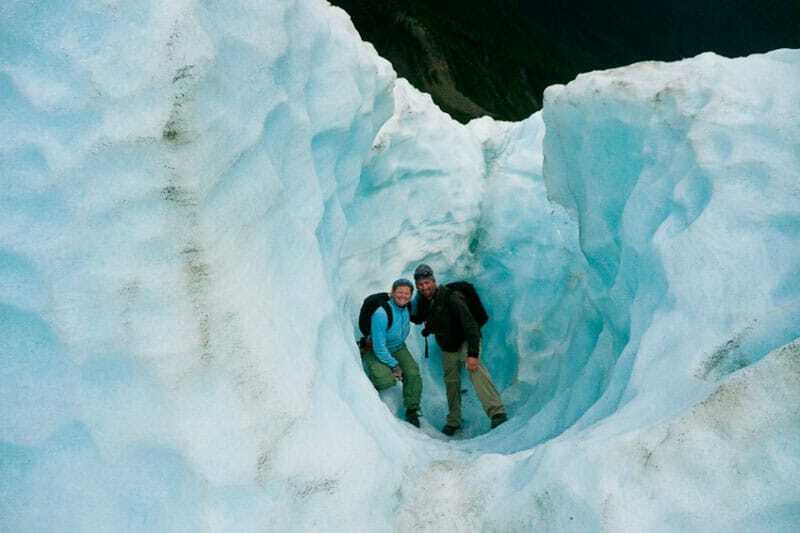 We could peer into holes, crevasses and moulins with a relaxed feeling. We didn’t need Ruth to hold on to us to keep us from falling in when trying to catch a glimpse into the deep blue. Frozen water leading down a deep hole is one of the most beautiful sights on earth. 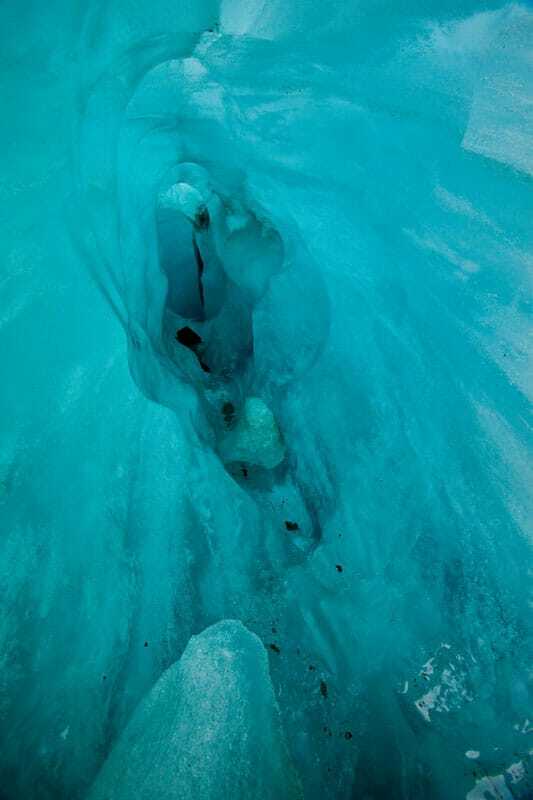 The ice is a vibrant blue that only a glacier can truly capture. I have never seen that colour anywhere else in nature. We took advantage of being able to walk right into crevasses and stand under a roof of ice. We followed Ruth in single file as she took us to different locations on the ice field. She said that she loves doing the full day walks because they never know where they are going to take us. The ice is constantly shifting and they “read it” and the conditions each day taking them through a different path each time they step foot on the glacier. We ended up at a rock that had just appeared this year. It worked it way up from below the ice surface and now stands high towering over the glacier field. That is the magical thing about glaciers. New holes can appear, rocks can become unearthed, ice breaks and landslides fall (known as morain) regularly changing the landscape and snows and rains can completely turn the surface upside down and all around. This was the end of our journey, we had made it to the ice field and Dave commented on how it reminded him of the Khumbu Ice Field at Everest Base Camp. We only had the chance to witness the Khumbu Ice Field from above as we sat at base camp on Everest so it was a unique experience for us to see the Fox Glacier icefield from below. We noticed ice climbers just off in the distance. They were running through the field with ease setting up ropes and climbing atop the jagged rocks. We knew that we would have to come back here to ice climb. Fox Guides also offers ice climbing tours so you can count on us going on one. It has been high on our bucket list for several years to ice climb. Maybe in New Zealand we will finally get it done! The massive strength that the earth has is astonishing. These glaciers formed mountains and continents, lakes and rivers and seeing the jagged mountains of ice above, it is easy to comprehend just how much power Mother Nature has. I highly recommend doing the full day tour to walk on a glacier. It is one of the great adventures that you can do in life, to walk on a structure that helped to form the earth the way we know it today. It's Aussie by Air New Zealand Time! 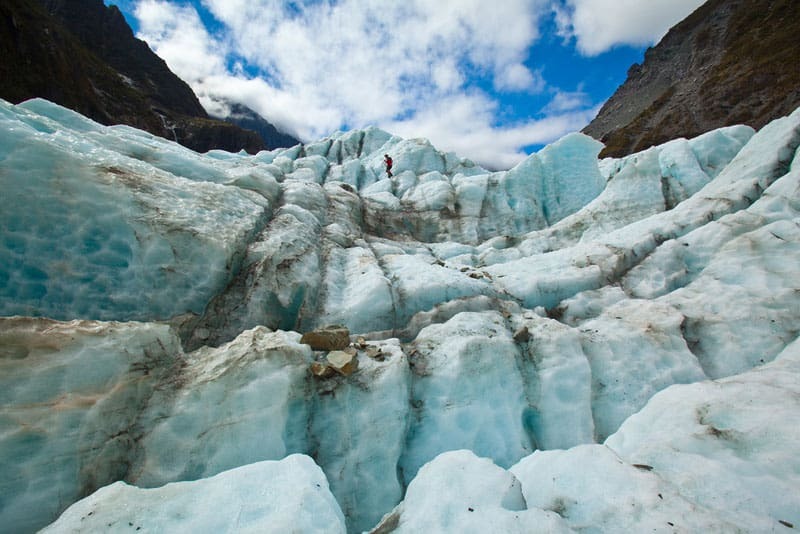 14 Responses to "Fox Glacier, New Zealand – A Dramatic Walk on the Wild Side"
The shapes the ice forms on the landscape are really beautiful. Incredible photography guys! We’re house sitting on the north island at the moment and are super excited to get down south to explore! Thanks for feeding our wanderlust!! These photos tempt me to go… they are incredible! Thanks for sharing! Fox Glacier was awesome. We had an ice climbing excursion booked as well, but the weather turned bad when we were there and it was cancelled. So bummed about that one! Wow! 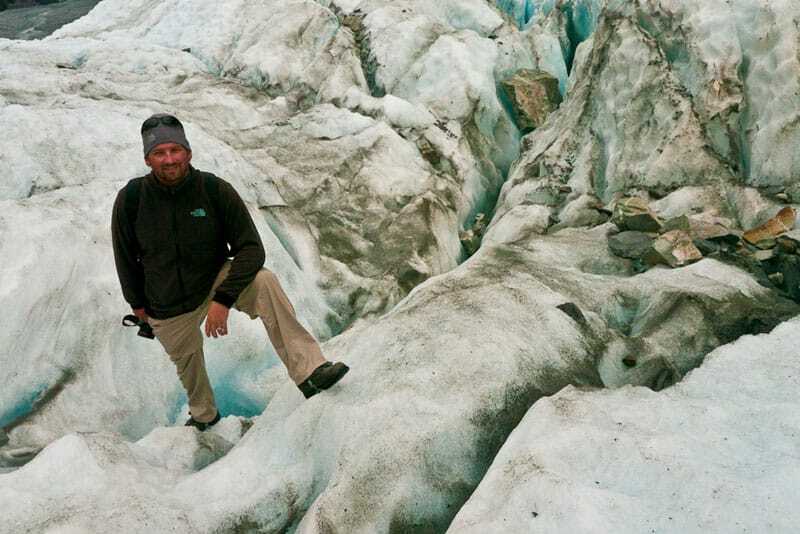 In Alaska, I spent about 30 minutes on a glacier, and it was incredible. Then, I was supposed to do a longer trek but it got rained out. I love these photos! Wow, this is quite an adventure, really amazing photos. Incredible pictures… Looks absolutely amazing! I love the colour of the ice. That place looks amazing. I would love to climb down into the ice caves! Beautiful pics… I can’t seem to get tired of looking at sights of icebergs and glaciers. There’s something about them that’s both awe inspiring and soothing at the same time.